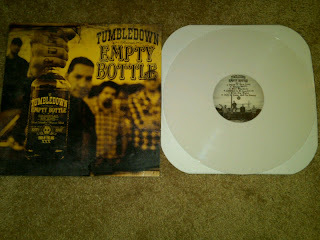 Mike Herrera, one of the hardest working men in punk rock, is back for another round with Empty Bottle, the second full length studio album from his “alt-punktry” band Tumbledown. In Tumbledown, Mike’s songwriting echoes the barroom brawlers and balladeers of the outlaw country scene of the 50’s, 60’s, 70’s and 80’s, while still incorporating his own brand of punk aesthetics. Imagine Willie Nelson wearing a Ramones t-shirt or Milo Aukerman in a cowboy hat and you’ll be getting pretty close. Tumbledown’s songs are mainly filled with the well-worn woes of drinking, being lonesome and being on the road. But like Johnny Cash singing, “I shot a man in Reno just to watch him die,” Mike does it in such a big persona kind of way that it mostly comes across as a charicature. He takes liberties in creating certain settings and headspaces to get his whiskey-soaked songs across. But don’t worry, eventhough Empty Bottle is absolutely 100 proof, it will entice you to drink about as much as those “Blood on the Highway” videos did back in school. Instead of party all night, pass the hooch, raging kegger songs; these are sad, tear in my beer, faded memory, lost my girl country songs. Oddly enough though, the more sad and lonesome they get, the more I seem to enjoy them. One of my favorite things about Tumbledown is the fact that whether they’re playing floor-stompers or tearjerkers, they nail the musical vibe of every song perfectly. Mike’s acoustic can chug or cry, Jack’s electric leads pick up where Buck Owens’ left off and the backbeat provided by brothers Marshall and Harley hasn’t sounded this tight since The Tennessee Three. Songs like “Drink To Forget,” “She’s In Texas (And I’m Insane)” and “Not Hung Over” could easily be mistaken as covers of some old Sun Studio records from the 50’s. Even when they’re flooring the pedal on songs like “Arrested In El Paso Blues” and “St. Peter,” there’s enough twang beneath the tattoos to let you know where these boys are coming from. They've also invited some of their musical friends to spice up a couple songs, including Andrew Anderson on mandolin, Ki Anderson on cello, Todd Bean (Lucero) on pedal steel, Louis DeFabrizio (Gasoline Heart, Dear Ephesus) on vocals and Chebon Tiger (New Old Stock) on harmonica. Lyrically throughout Empty Bottle, Mike goes back and forth between drowning his sorrows and playing “Marco Polo” with them. But just like the old “drinkin’ and fightin’” country songs that Tumbledown is patterned after, the alcohol never delivers and things rarely end well. Lines like “Maybe it’s time to face the facts, time to face the morning light” from “Bad News” and “Don’t lie to me, I already lie to myself, I’ll put away my tears and the bottle back on the shelf” from “Drink To Forget” show that Mike is honest about the outcomes within all the suds and shenanigans. 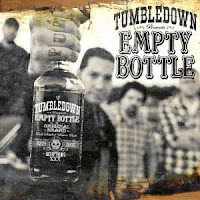 I’m really enjoying Tumbledown’s fresh approach to the alt-country/outlaw/rockabilly ethos and unless I wake up with my head on a bar one day, I’ll be pumping them for a long time to come. Besides, I can quit anytime I want to, honest! Here's a pic of the gorgeous white vinyl version. Only 100 of these bad boys so get yours from End Sounds quick!